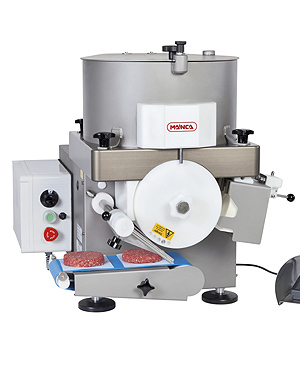 MAINCA - Automatic Hamburger Machine for meat processing equipment. 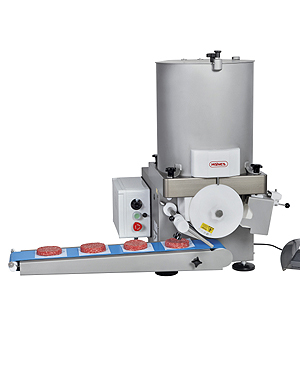 Strong and reliable automatic hamburguer machines equipped with variable speed drive. Production: up to 2200 or 4400 single forms per hour depending on model and type of moulding drum. Triple form drums will triple the production. Operation: Automatic or Manual with the foot pedal. The machines are not just excellent burgers makers, they are also capable of forming a multitude of non-meat products, such as cheese or pastry dough no matter how dense they may be. 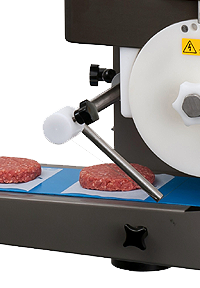 Optional: Automatic paper attachment that places a waxed paper under each burger. Drums with different forms and sizes available: round, oval burgers, nuggets and other special shapes. The thickness of the piece is easily adjustable in each drum. All parts that need to be cleaned (hopper, paddles, drums and conveyor belt) can be easily disassembled without tools. Construction: Made of stainless steel 18/10 and food grade Ertalyte.